'How could you, a mathematician, believe that extraterrestrials were sending you messages?' the visitor from Harvard asked the West Virginian with the movie-star looks and Olympian manner. Thus begins the true story of John Nash, the mathematical genius who was a legend by age thirty when he slipped into madness, and who -- thanks to the selflessness fo a beautiful woman and the loyalty of the mathematics community -- emerged after decades of ghostlike exixstence to win a Nobel Prize and world acclaim, the inspiration for a major motion picutre. 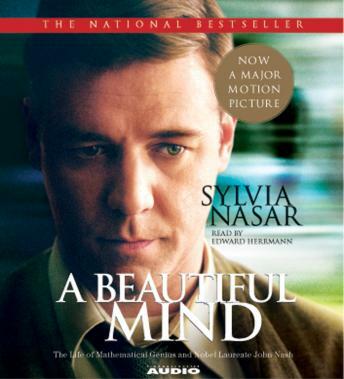 Sylvia Nasar's award-winning biography is a drama about the mystery of the human mind, triumph over incredivble adversity, and the healing power of love. This book is interesting and a little bit of a history book. A good listen. A little dry once in a while. I enjoyed the movie and I usually like the books much better so I thought I would give it a try. I couldn't finish it and had to send it back unread. The beginning of the book is so technical and contains so much mathematical theory that is is lost to anyone but another mathematician. I have not seen the movie that was produced from this book, so I had no expectations about the story. I found Dr. Nash's life quite interesting, if not somewhat depressing. But what journey in and out of schizophrenia wouldn't be depressing? What amazed me was his spirit and will to continue living, despite the numerous hospitalizations and ongoing employment problems. Many people would have just drifted away, or committed suicide. His ex-wife should win a Nobel prize for her patience, understanding, and all the help she gave him over many decades. If you enjoy the "Charlie" character on the CBS hit series "Numbers," you will enjoy the technical mathematical and economics concepts presented in this book. Excellent story, and wonderful reader! I had already seen the movie and really enjoyed it. The book was very different and sometimes hard to follow as it got into so much detail about the work Nash was performing. It is somewhat sad, with a happy ending. I found it less interesting than the movie. I loved this book. The John Nash of this book is not at all like the Ron Howard film version. A fascinating study of a brilliant, but disturbed mind. It's not the math, it's the person. But it is terrific to hear about Princeton's mathematics dept in the 50s. Very well read, too. Highly recommended. What a story! This is a fascinating story and is very well read. I had seen the movie and really liked it, so I wasn't sure how much better the book could be. I was wrong! The book's much better. A lot more details. A lot more mathematical talk. You get a real feel for the depths to which the mental illness took him. How much it robbed him of his life, and us for what he might have done. Great book!